Each year begins and ends on the same day. 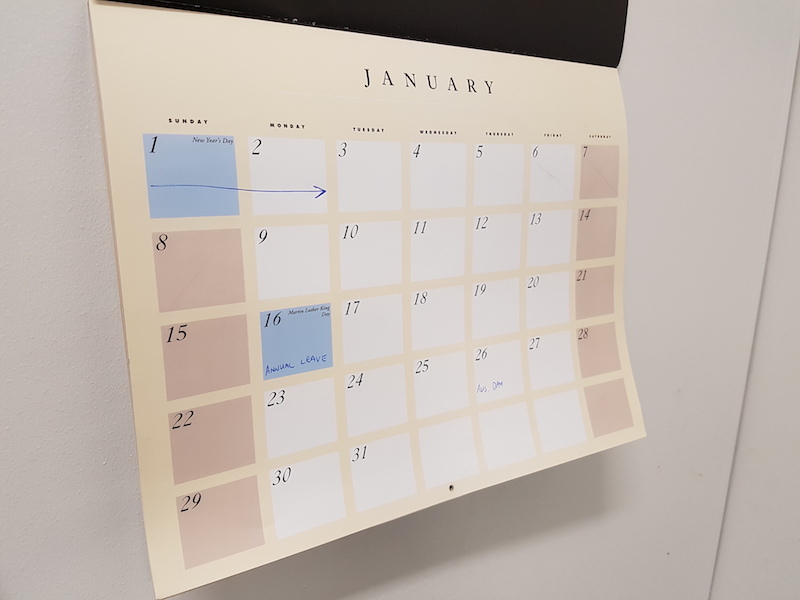 Every subsequent year starts and ends on the next day of the week. Every 7 years this cycle repeats itself. 2016 begun and ended on a Saturday. This means that 2017 is a year that will both begin and end on a Sunday. This is an important point. It also means that doing an end of the week review on a Sunday afternoon is particularly pleasant for those of us who may lean towards the higher level of pedantic. Each weekly Sunday review will bring us one complete week further into 2017. 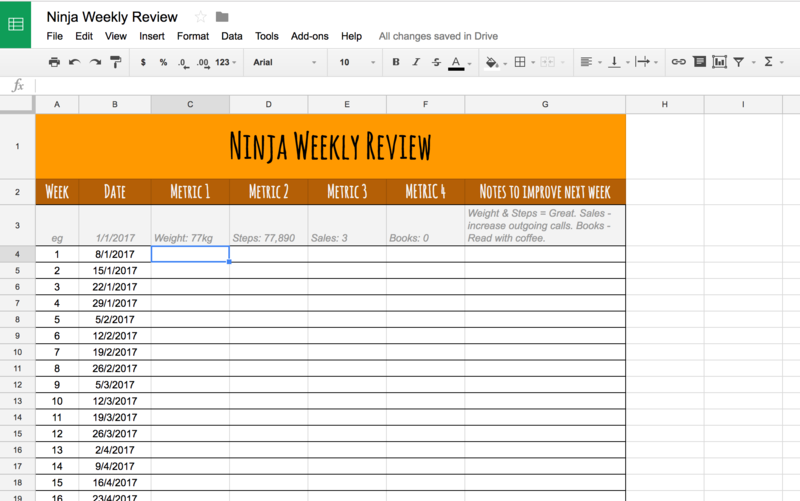 Doing a weekly review will make you a productivity ninja in 2017. You will allow you to cut through the crap and drill down into making this the best year yet! Looking back over your week gives you the information you need to execute productively in your next week. James clear explains how powerful this can be in his Measuring Backwards, Not Forwards piece. By reviewing the most recent wins, losses and behaviours we can capitalise on the good things and put a quick stop to any negative habits forming. This adaptive, data driven review means you're never in the dark about progress towards your goals. Knowing the past gives you the power you need to change the future. This iterative habit only grows the more you implement it. Before starting your weekly reviews you need to know what goals you are working towards. Choose the things that are important to you or your business. Pick the main metric that will allow you to measure that quickly and consistently. If you're goal is to read more books then the metric you should track is pages read this week or books completed. If you're aiming to grow your business then you should track sales or leads created this week. This will quantify your actions and give you a number to measure and track over time. Plug this number into a spreadsheet. I have created a Google Sheet for you to copy and customise to your own review needs. You can find it here. Sit down with a strong cup of tea on Sunday and enter the metrics for the past week into your spreadsheet. This data tracking shouldn't take too long. Did you do well this week? Did you improve on last weeks effort? What did you do great? What can you implement next week to make it better? By answering these questions honestly you will have a solid game plan on how to improve next week. Synthesize your thoughts into actionable dot points and write them down on a post-it note. It needs to be a post-it note because there should be a heavy space constraint - short, actionable points reign supreme. 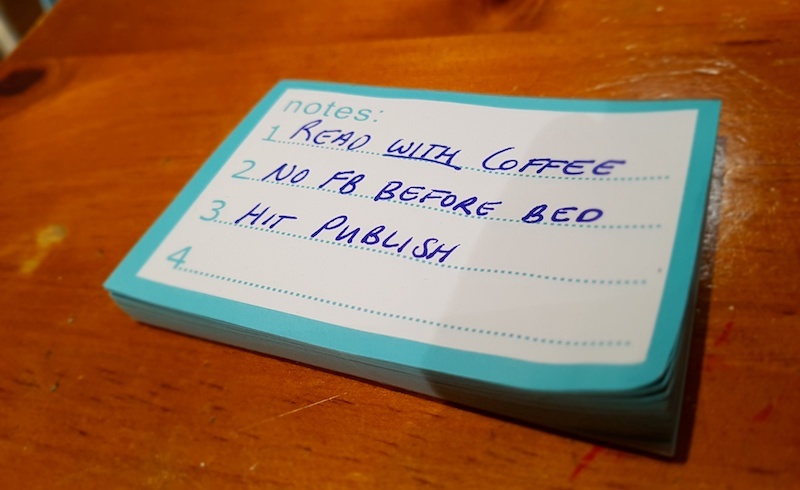 "Read with coffee", "No Facebook before bed", "Hit Publish"
Tracking and planning don't meet goals. Action does. Once you have your game plan in place make sure you pull the trigger and make those incremental improvements. If your post-it note is telling you to "Read with coffee" you had best make sure you have your book there are waiting with your cup of joe. Is this goal really important to you? Why aren't you taking action? The power of this excercise comes from consistency. You need to repeat it every week. Improving your weekly performance for 4 weeks out of the year will have little to no impact. However, if you're increasing your performance week in and week out all year by next year you will have achieved more than ever. Take 25 minutes (that's only one Pomodoro) out this Sunday and complete a Ninja Review. The benefits will be legendary. How are your weekly Ninja Reviews?